Why Waste Time Manually Processing R?um?? On Monday you advertised for a new position. It's now Wednesday, and you have 50,000 e-mails sitting in your Inbox! With ResumePipe you can eliminate this nightmare in minutes! Give your Human Resources professionals 3-7 hours back PER DAY by automatically extracting e-mails and attachments ready for import into your Applicant Tracking System (ATS). Increase efficiency, lower your costs while keeping accuracy at 100%. ResumePipe does not need OCR technology (scanning) to interpret the text. ResumePipe's text manipulation and cleansing functions are easily the most sophisticated of any product in the market. Easily audit emails sent and received. Processing incoming data files e.g. Excel spreadsheets, CSV or tab-delimited files for automatic processing. These emails might be sent to you on a regular basis from an external source e.g. product catalogue data, price lists etc. ResumePipe comes with TextPipe Pro, a sophisticated text processing application that reformats each e-mail and attached resume to your standard format and cleans up any special characters and white space that appears as junk characters or misaligned text. ResumePipe connects to your e-mail client program, grabs each e-mail and its attachments and combines and saves them to a single file. These files can be easily imported into resume packages such as ResTrac or imported into a database. Control where e-mails come from and what is done with them after processing, such as moving them to a new folder (Click to enlarge). So after several tests I became a believer. This wonderfully simple application not only processes every attachment and message, but can also recognize those files that are resumes and process them in any set of predefined formats. It can also filter and automatically strip out any extraneous header or footer data and give you that perfect scannable resume. Specify a TextPipe Pro filter to cleanse the text files (Click to enlarge). We offer consultancy services to design filters to suit your needs, such as inserting processed resumes directly into your database. We can also generate custom versions of ResumePipe tailored to suit your needs. Virus scanning continues to take place on all opened emails and documents, so your corporate infrastructure remains secure. ResumePipe automatically extracts data from Word documents, text files, web pages, Rich Text Files (RTF) and other common document formats. It also processes attachments inside forwarded emails. Based on their type, attachments can be opened, ignored, printed, saved or flagged for manual handling. Attachment processing can be customized for new attachment types and can also be disabled. Control precisely how each attachment type is handled (Click to enlarge). Process e-mails in various sort orders to suit ATS import requirements. ResumePipe is used by TMP.WorldWide (owner of Monster.com), Johnson & Johnson, BEKS Data Services, Houston ISD, Microvision Inc, the National Drug Intelligence Centre, M&T Bank, First Union/Wachovia Bank, LSI Logic and many other large organizations. ResumePipe runs on Microsoft® Windows® 10, 8, 7, Vista®, 2016/2012/2008/2003 Server, XP x32 and x64 and requires Microsoft Word and a MAPI-compliant e-mail system. ResumePipe allows your HR staff to spend their time finding the best candidates for you rather than spending hours on wasteful and unnecessary manual processing. Unlike other systems, ResumePipe does not use scanning technology (OCR) to interpret each resume. Instead it electronically extracts the content from each attachment, keeping accuracy at 100% (where it should be). 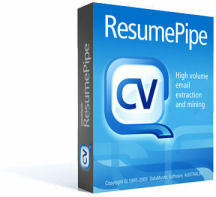 TextPipe Pro (included with ResumePipe) reformats the e-mailed resumes to give a consistent and professional look to resumes. If you have trouble setting up extraction yourself, why not pay one of our resume parsing experts to do it for you?